There have been times in the past when I’ve gotten crosswise with certain segments of the conservative base and/or with the readership of National Review. And, because, like the Elephant Man, I am a not an animal but a human being, I have always had at least some self-doubt. That’s as it should be. People who share principles should not only hear each other out when they disagree; they should be able to see each other’s points and hold open the possibility that one’s opponents have the better argument. #ad#This is not one of those times, at least not for me. I truly, honestly, and with all my heart and mind think Donald Trump’s most ardent supporters are making a yuuuuuuge mistake. I think they are being conned and played. I feel like a guy whose brother is being taken advantage of by a grifter. I’m watching helplessly as the con artist congratulates him for taking out a third mortgage. Now, before I go on, let me clarify a few things. I get it. The base of the party is angry. They’re angry about Obama’s lawless chicanery on immigration. They’re angry about the GOP’s patented inability to cross the street without stepping on its own d*ck and then having to apologize for it. They’re angry that the Left’s culture warriors are behaving like an invading army that shoots the survivors even after they’ve surrendered. They’re angry that Republicans have to bend over backward so as not to offend anyone, while Democrats have free rein (and at times free reign) to do and to say as they please. Enter Trump, stage left. He makes no apologies. He’s brash. I can understand why some see him as a breath of fresh air. If you want to give him credit for starting a worthwhile debate about sanctuary cities and illegal immigration, fine. I think that argument is way overdone, but certainly reasonable enough. Trump supporters need an intervention. I want to sit them down at the kitchen table, reach into a manila envelope, and pull out the proof that he’s a fraud. Maybe you just like him. On that, we can respectfully disagree, as there is no accounting for taste. Perhaps you just like his musk and the way it assaults your nostrils, which is fitting, given his line of cologne. Fine. I, on the other hand, find him tedious, tacky, and trite. He’s a bore who overcompensates for his insecurities by talking about how awesome he is, often in the third person. Jonah can’t stand that. You see the next Teddy Roosevelt and all I see is someone who talks big and carries a small schtick. In words George Will shall never write, this is a good moment to talk about my pants. Earlier this week, Donald Trump attacked Charles Krauthammer and me. By the way, I don’t blame Trump one bit for his hostility. I’d hate me too, if I were him. Still I do marvel at how this supposed Master of the Universe can be unnerved by such criticism. If it takes so little effort for me to set up shop in his head, by all means, let’s give him thermonuclear weapons. I’m worth a fortune. . . . I went out, I made a fortune, a big fortune, a tremendous fortune . . . bigger than people even understand. . . . Then I get called [a failure] by a guy that can’t buy a pair of pants, I get called names? As the intern said to Bill Clinton, this puts me in a weird position. I don’t like to brag, but I’m actually quite adept at buying pants. I don’t enjoy it. But I can do it. 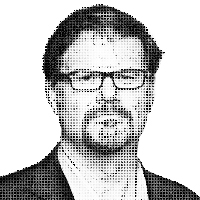 It never occurred to me to put it in my bio or anything — “Jonah Goldberg is a senior editor of National Review, a fellow at the American Enterprise Institute, and a successful pants-buyer” — but maybe I should. Now, I will say that I sometimes choose not to wear pants, and not just because I’m so fond of my spaghetti-strainer codpiece (which affords me the satisfaction of telling really attractive women, “Hey, my eyes are up here. Thank you very much”). But these are my choices. If I want to identify as a pantless American, who are you to say otherwise? More to the point, what I find so gaudy about Trump is his constant reference to the fact that he made a lot of money, and his expectation that it somehow makes him immune to criticism or means that he’s a better person than his GOP competitors, never mind yours truly. Moreover, I find it horribly disappointing that his fans like this about him. If you met someone in real life who talked this way, you would think he’s a jerk. But somehow he’s awesome when he does it on TV? The most troubling defense is this claptrap that he ‘tells it like it is.’ Well, first of all, no he doesn’t. He tells it the way you want to hear it, which is an entirely different thing. But most grating of all are the people who sincerely think he should be the Republican nominee for president of the United States. On this, I’m afraid we’re going to have to disrespectfully disagree. First of all, he’ll never be president of the United States. I won’t go into all of the reasons I think this, but a few off the top of my head: his enormous negatives, even among Republicans; the Midas’s hoard of oppo-research material that surely lurks beneath the surface; and his comments about women, which alone would turn the gender gap into a chasm. To borrow a line from Mark Steyn, a President Trump would have more ex-wives than the previous 44 presidents combined. But my objection isn’t to the political analysis of Trump supporters. It’s their judgment of the man that stews the bowels. ​Which gets me back to the grifter thing. I’ve written many times about how I hate the term RINO because conservatives should consider themselves Republicans in Name Only. The Republican Party is a vessel, a tool for achieving conservative ends. It’s nothing more than a team. Conservatism is different. It’s a body of ideas, beliefs, and temperaments. The amazing thing is that Trump is both a RINO and a CINO. I’m sure he has some authentic and sincere conservative views down in there somewhere. But the idea that he’s more plausibly conservative — or more loyally Republican — than Ted Cruz, Rand Paul, Scott Walker, or any of the others is just flatly absurd. It is vastly more plausible that he is a stalking horse for his dear friend Hillary Clinton than he is a sincere conservative. Trump: You have to give them a path. You have 20 million, 30 million, nobody knows what it is. It used to be 11 million. Now, today I hear it’s 11, but I don’t think it’s 11. I actually heard you probably have 30 million. You have to give them a path, and you have to make it possible for them to succeed. You have to do that. Question: Just how many rapists and drug dealers did Donald Trump want to give green cards to? Man, it’s like he’s channeling Thomas Aquinas there. Now he says he’s pro-life. But I’ll spare the mocking on this because at least he’s flip-flopping in the right direction, and I don’t like to second guess peoples’ professed religious convictions. Obamacare: The man wrote in his own book and said elsewhere that he was in favor of Canadian-style socialized medicine — which would put him to the left of Hillary Clinton and Barack Obama, and on pretty much the same page as Bernie Sanders. Economics: People tout the guy’s business record. But he represents almost exactly what his supporters think he opposes. He’s a crony capitalist par excellence. He gives to whatever politician can grease the skids for his next deal — and he makes no apologies for it. He’s an eminent-domain voluptuary. He abuses bankruptcy laws like a stack of homemade get-out-of-jail-free cards. “The people of Nebraska are for free silver, and I am for free silver,” Bryan announced. “I will look up the arguments later.” That is Trump’s approach. He’s saying what understandably angry people want to hear him say. Trump is even less truly conservative, but he’s trying to speak in an even grubbier dialect of conservatism. And, having grown up in the tabloid politics of New York, he’s better at faking it. Eventually, I suspect, this will be the cause of his undoing. He doesn’t know what he doesn’t know about conservatism, and at some point he will say something that even his biggest fans will recognize as a damning revelation about the real man beneath the schtick. The only question is whether he implodes before or after he does permanent damage to the GOP’s chances in 2016. Look, these are rough times for conservatives, for reasons too lengthy, and all too familiar, to go into here. But none of our problems — demographic, political, cultural — can be solved unless conservatives take the cause of persuasion to heart. All of our problems can be fixed by convincing people to join our cause. That is what politics is about — persuading people that their interests and concerns are better addressed by coming to our side. And, given the degraded nature of our culture, I won’t deny that having a celebrity on our side has its utility. But it’s only helpful if that celebrity convinces people to switch sides. As a purely mathematical proposition, it is insane to believe that Donald Trump will convert more voters than he will repel. For those who are interested in persuasion, I heartily recommend Arthur Brooks’s new book, The Conservative Heart (full disclosure: He’s my boss at AEI and a friend). I’ll be writing more about it in the future because I think it’s an important book. But I will say for now that it is almost a mirror image of Trump’s approach. It’s thoughtful, humble, fact- and data-driven, and informed by a deep moral case for conservatism. It won’t satisfy your desire to scream at the opposition, but it will equip you to explain to the opposition why they are wrong. Zoë update: She has never been a better girl. Whatever happened to her in the kennel last year that turned her into a canine bully seems to have been forgotten. She’s no border collie — she can’t paw out the square root of pi to the 20th digit — but she listens to commands more and more. The only downside is that her sense of entitlement seems to know no bounds. She often insists on sleeping between my wife and me, like she’s some kind of canine chaperone and we’re unwed teenagers. She’s also becoming a more adept killer. I know the war on squirrels is an existential and eternal struggle, but frankly I’m not a big fan of cute things killing other cute things. We also seem to have a major influx of bunnies in our neighborhood and their inability to climb trees is a major tactical advantage for her. Still, a dingo’s gotta dingo. The other week I joined the Wheels Down podcast to talk about the death penalty. By the time you get this, the latest GLoP podcast should be up at Ricochet. I’m not sure there will be a G-File next week as I will be in an undisclosed location where there is no WiFi or cell service. If that sounds mysterious, then I have succeeded. So, just in case, here’s an extra helping of weird links. Photobomb by ghost in this Edinburgh haunt? Worst proposals of all time? It’s a dolphin! It’s a horse! It’s a . . . sea monster?